When in doubt where white &amp; a leather jacket. Always a simple but awesome combo, probably my favourite go to when I don't know what to wear. I got this dress purely to wear on hoiday, maybe the cut-outs are a bit risque but I dont care. It only occoured to me today I dont own any simple vests for occasions like this! Must stock up on basics next time I have some money! Was running out of light so just a few snaps for today. Changed into my PJ's now and snuggled into bed, My throats all better now but I now have sinus pressure &amp; a head cold, really cant win at the moment. I hope everyone is well and having a good Saturday. The rest of mine will be me moping over not seeing The Strokes at Reading &amp; Leeds festival and finishing reading Looking For Alaska. I have so much love for John Green, I wish he was my husband. It clashes with the dress in an awesome way... love it! I really love the combination of that jacket and dress. I have that dress, and I love the jacket, they look so nice together! alas, my sister beat me to that dress..
Lovely outfit. It's great you can make use out of a holiday dress too! This dress is absolutely adorable! I might just have to get it myself. And I really love your jacket as well! Love your nails, they're beautiful! Hope you have a nice Saturday evening, I'm spending mine with a glass of rose and watching the X Factor! I really love your eye-make-up today! I hope you feel better soon. 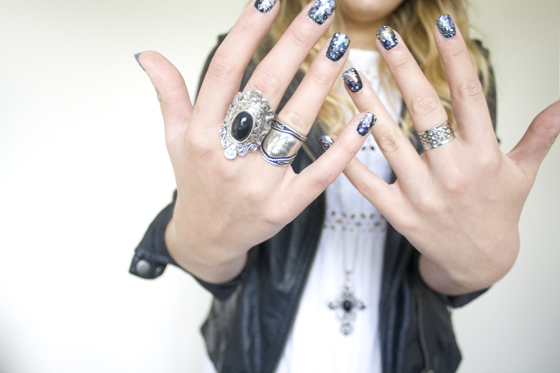 :) I love your jacket and nails, your super pretty, and your style is awesome. Your leather jacket is awesome! yeah leather jacket and white always goes with eachother :-) nice pics! The outfit's great - but I'm totally in love with your eye make-up! Summer dress + leather make such a pretty combo. Looking darling, girl! 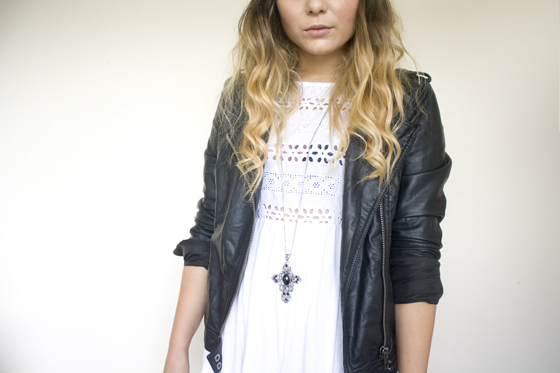 Love your dress with the leather jacket! I also love all of your gorgeous jewellery, I feel rather jealous of your beautiful rings and necklaces, as always! Awesome outfit! I love the details on the dress! ok I love everything about this outfit! the white dress and tough leather jacket combo is so gorgeous and your nails are so amazing! glad your throat is getting better! I like the jacket - doesn't look like it's from primark at all! My saturday night consists of: Dr who (yes), x factor, big brother. In PJs. Perfect! love the nails, stellar amazing!! You look stunning again! I cant get enough of your blog! totally in love with your necklace and dress!!! 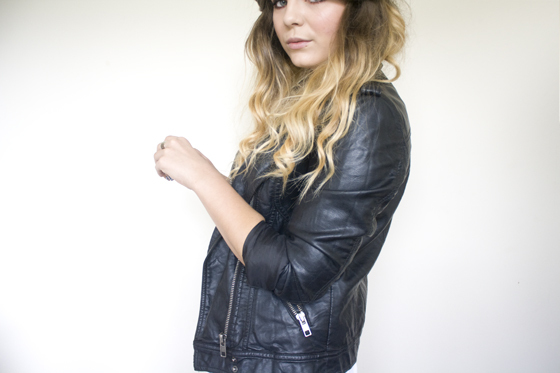 Your outfit looks lovely, I thiink leather jackets go with pretty much everything! I love your nails too! I am in LOVE with that dress, don't think New Look sell it any more but it is so pretty, I've seen so many people wearing it. Sorry to hear about the sinus pressure, I suffer from that sometimes after a really bad cold, it really is very uncomfortable. Take lots of Sudafed and have lots of rest. Absolutely love that dress and your eye makeup today!! Is it Coppering e/s or Mythology, it looks similar. Such a sweet dress! Amazing nails too. your dress and necklace are gorgeous! I really can't say this enough, but it's so nice to see you're a Strokes fan! They're my favourite too! Oh my gosh, I totally feel you. Not seeing the Strokes is really bad!! Imagine, Julian Casablancas in a leather jacket... Swoon! But, Looking for Alaska totally makes up for that, not? I read that book last summer and re-read it straight away. It is just fabulous. Go and read Papertowns as well, it was so great, too. you make me want to haul my leather jacket out of hiding!! loving your hair here too, could you get any more beautiful? I am just in love with your nails, you have a real knack for it! White and a leather jacket is pretty much a win win combination! Oh I love this Outfit. It´s a simple combo but with a wow-effect, lovely. I wonder what eyeshadow you´re wearing on the photos..? I have a cold too, over a week now, very annoying! Love this outfit! I love to mix delicate girly prints with a leather jacket! Its a good way to bring your summer wardrobe into autumn! 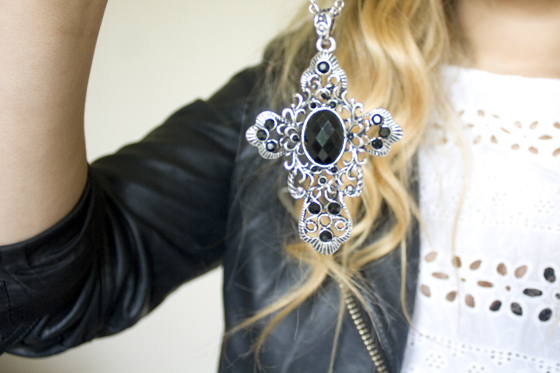 Lovely photos, do you ship your jewellry to the Channel Islands? Love your nails, they are amazing! Must have taken a very steady hand and patience to do though! The dress is lovely as well. Did you do the nails yourself? I've been trying to look for galaxy nail wraps with no luck! love this outfit, definitely agree with using a leather jacket as a go-to, i depend on mine a lot! This is an awesome look. You do have a hair grip hanging off your hair in the third pic though... lol. This is a gorgeous outfit - I also love your eye make up! Love the white and leather combination... I think it's *finally* getting cool enough to wear leather, so will definitely be digging my biker jacket out next week! LOVE white and leather =) I think it looks great on you. love your blog btw! and your makeup looks perfect! Hey, I just tried this recently myself! I don't think mine was as successful as yours - got a bit glitter happy I think! Looks great! love the new waves in your hair! 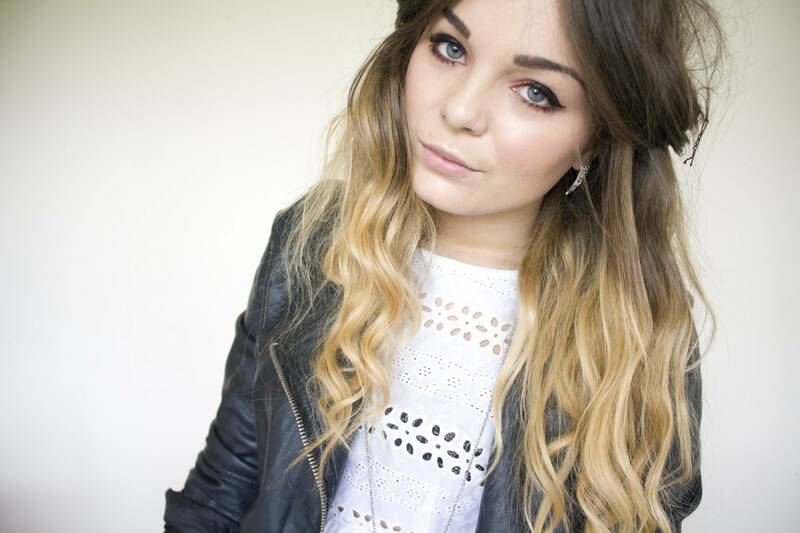 I'm Soooo in love with your blog , your style and your HAIR !!! I like the pendant which is shown in last picture.